These yummy strawberry white chocolate chip cookies look like bakery cookies but are a busy cook’s best friend. They can be made in a snap, thanks to the convenience of strawberry cake mix. Every year, a similar strawberry cookie appears (just prior to Christmas) in the Publix bakery. I’ve tasted them, and these are almost identical. Strawberries and white chocolate make a perfect combination, and these cookies give you the best of both worlds. This easy as pie recipe yields a cookie version of a white chocolate dipped strawberry! These cookies are ridiculously easy to make and freeze beautifully–making them a great make ahead treat for holidays or special occasions. Wrapped in a cellophane bag and tied with raffia, these cookies would make a sweet Vanlentine’s Day teacher gift. 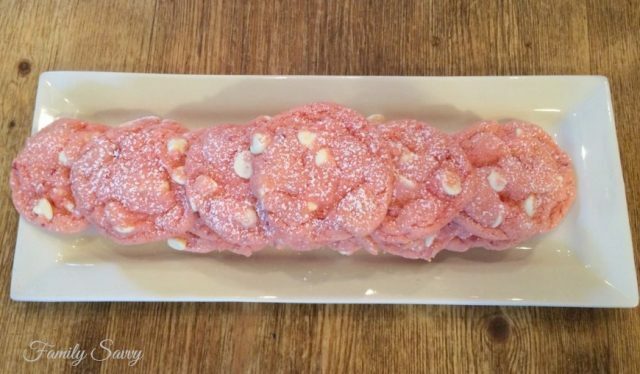 On any occasion where pink is called for, these cookies fit the bill. If your sweet tooth preference is for bar cookies, do try these strawberry brownies. Also made with strawberry cake mix, they are beyond yummy! They taste very much like the end piece of strawberry cake–but much easier to make! 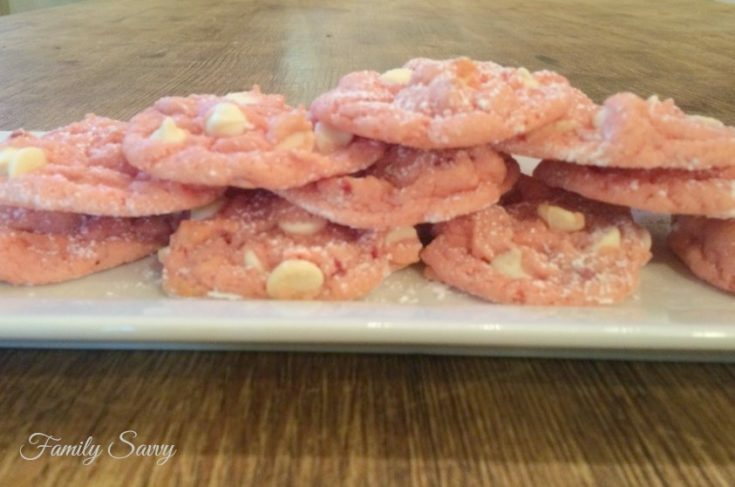 If you try this yummy pink & white fave cookie of mine, please leave your thoughts/opinions/suggestions in the comments of the post. I love hearing from readers:-) As always, thanks so much for stopping by. Be blessed, and stay savvy!!! Line cookie sheet(s) with parchment paper. In medium bowl, combine butter, eggs, and cake mix. Mix until well incorporated and smooth. Roll dough into 1" balls; arrange 2" apart on cookie sheet. Bake 8-10 minutes until puffed and beginning to brown at edges. Cool; store in airtight container. I wish you had put how many it makes. 1 dozen or 5 dozen? I don’t want to waste my time just making a 1 1/2 dozen.